The Book Chook: Book Review, Can You See A Little Bear? Book Review, Can You See A Little Bear? There's just so much to love about this beautiful picture book. It's the sort of book that, when you've finished reading it, you want to glide your fingertips across its cover while you dream. Can You See A Little Bear? 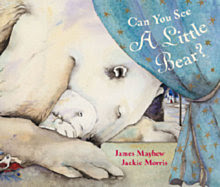 was written by James Mayhew, illustrated by Jackie Morris (Frances Lincoln, 2006), and sent to me for review by Walker Books. The text is spare, rhyming, and wholly effective in combination with the wonderful illustrations. Can you see a little bear standing on a ball?" If you read this book aloud, and I hope you will, take your time on each page. Kids will need time to gaze and search and ponder over the illustrations. I predict their faces will be filled with wonder as they watch the exotic characters move through fantasy landscapes. On each double page children are encouraged to follow simple clues and find Little Bear. The book is multi-layered. There is so much happening on every page, little ones will discover more and more as they revisit the story. It includes concepts like big and small, fat and thin, day and night, and colours, making it suitable for the very young. Older kids will relish finding favourite details in the pictures, and learning to read the book alone. I loved recurring motifs like the blind mice, peacock feathers, flowers and bells. The rich patterns and textures on every page give the book a sumptuous feel, and I'm sure the hints of whimsy - toothbrushes for crocodiles, three different sized bears, and a cackle of kookaburras on Little Bear's bathing tent - will produce smiles of delight on faces all over the world. Kids might be prompted to create their own fantasy worlds, dress up like Little Bear does, create their own circus performance, or discuss the animals and characters on each page. Can You See A Little Bear? makes a wonderful book for sharing, or for reading aloud. Above all, it is a picture book to be treasured.